The World Health Organization, Health Canada and the US-EPA have identified over 80 different contaminants that impact water quality, and potentially the health of people. Contaminants, such as those found in the "Guidelines for Canadian Drinking Water Quality" have regulated maximum allowable limits in water. These contaminants are primarily pesticides and metals which are usually colorless and tasteless, and thus our bodies cannot detect their presence in drinking water. The only way to confirm your water purity, is by chemical analysis. Types of water contamination our bodies can detect include colour, turbidity, salinity, bad odours and taste. We instinctively know not to drink water that is cloudy, or has a bad odour, but we do not have that early warning system with metals and pesticides in water. So how do I know if my water is safe? Start by phoning Island Waterworks. We will be happy to discuss your situation and determine if an analysis of your water warranted. 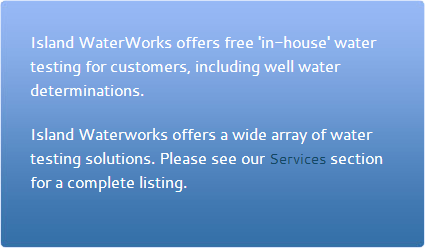 If required, Island Waterworks will be happy to sample and analyse your water. Data from the analysis is compared to Water Quality Guidlelines to verify compliance with municipal, provincial and federal criteria. Island Waterworks will discuss the analytical report with you, to ensure you have peace of mind about your water quality. If your drinking water comes from a private well, it is important to get the water tested by a laboratory to ensure the drinking water is safe. Your well water may not be safe, even if you are not getting sick. Some chemical contaminants sometimes found in well water, can cause long-term health problems that can take years to develop. Even though your neighbour's well has been tested and found to be safe, this does not mean your well water is safe to drink. Wells only a few paces apart can have different water quality. It depends on surface and underground geology, the depth and construction of the well, and other factors. If you get your water from a private well, the only way to know whether the drinking water is safe for you and your family is to get your water tested. Publicly-owned drinking water systems are tested regularly. These include municipal systems that collect and distribute well water to entire communities. Operators of privately-owned systems supplying water to communities or 500 persons or more in any given 24 hour period are also required to conduct regular water quality tests. If you are the owner of a private well, you need to have your own well water tested to determine whether your water is safe to drink. Island Waterworks provides full sampling and testing services with expert advice on your water quality and any treatment requirements. What might be wrong with my well water? Even though your well water may taste and look fine, there can be many harmful substances that you can not taste, see or smell. Some of these substances may infiltrate into groundwater as a result of human or other activities on the surface. Nitrates from animal wastes and fertilizers have been known to filter down through the soil, and contaminate ground water. Faulty in-ground sewage disposal systems, or spills of chemicals beside or near the well can also pollute groundwater. Call Island WaterWorks if you suspect your well is being polluted. Island Waterworks can assist in identification of the source and remediation. It is important to test your well water, and also to protect and maintain your well to prevent groundwater contamination of the well.